They wanted to raise money for Michael Sank. Michael is an MS sufferer who is paralysed from the shoulders down. He can’t use his hands and therefore using a mouse is beyond his capabilities. The Ameris boys wanted to purchase a piece of specialised kit which is added to Michael’s PC. This kit follows the movement of his eyes and thus allows him to control a mouse in this way. There are only 5 pieces of this type of equipment in the UK and it has ensured that the vital lifeline of communication continues for Michael in the face of adversity. 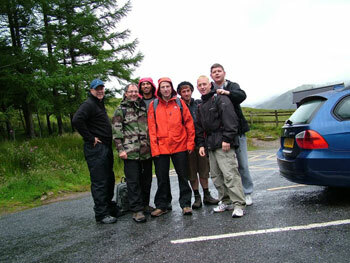 The Ameris team travelled to Scotland in July and at 7.15am on a Saturday morning began the 4500ft climb of Ben Nevis. Facing dreadful and dangerous conditions including sheet rain, gale force winds, freezing temperatures they eventually reached the top. Due to thick cloud, visibility was poor meaning a short stay at the summit for fear of literally falling off the side. They made it down in 2 ½ hours only to be greeted by a wonderful oasis – the pub at the bottom! After all the incredible hard work, determination and motivation, Jason and the team from Ameris raised an amazing £13,000. Jason then sourced the equipment for Michael and arranged shipping and installation. Michael is once again able to use his PC and we know he is, as we all are, so grateful and overwhelmed by Jason Conway and his team.